Excited to present you the new feature we have created for the CoinaPhoto social network. Welcome to Photoduels! If you are new to CoinaPhoto social network, let’s quickly introduce the idea behind. CoinaPhoto is a passionate community where photography enthusiasts and visual creatives are rewarded for their work. The network goes beyond the simple trend of sharing digital photographs. It is a place where they can express their skills and focus on the creative output. Besides regular photography contests and challenges, the network is a gaming and entertainment platform. CoinaPhoto users can gift games to online content they like. The players who play these games will earn CoinaPhoto tokens used for buying and downloading photos. 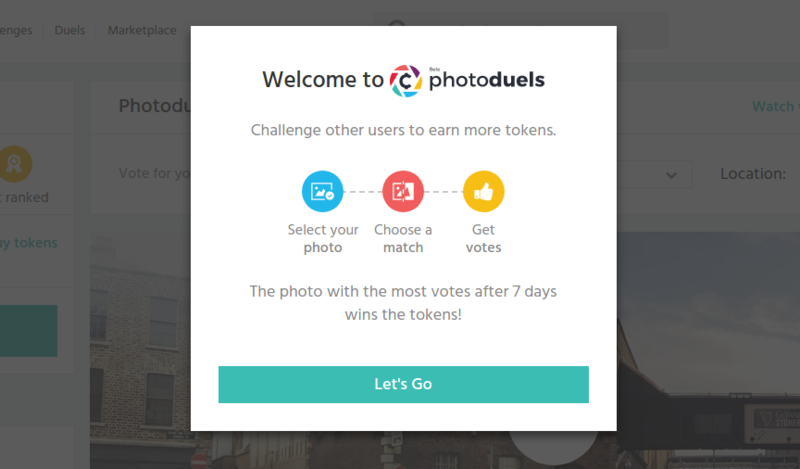 CoinaPhoto Photoduels feature is the latest entertaining experience for the CoinaPhoto community members. What is the Photoduels feature about? It’s the arena where you challenge other photographers with your photos. To begin a duel you will need tokens. CoinaPhoto social network uses tokens to help the community work. With tokens, users buy, gift and download photos from the Market. Tokens are redeemable, and one token holds the equivalent value of $0.20 USD. The members also communicate the value and creativity with tokens, using them to publicly recognize great work of fellow photographers through the act of gifting. You can earn free tokens, get tokens by participating in contests or games and earn by completing specific actions on CoinaPhoto. Learn more about the Token reward. How do you participate in the duels? How do you vote in Photoduels? Once you click on the Duel page you will be directed to Photoduel Arena section. Here you will see all active duels listed by date, but you can browse the list by selecting a location or choosing a category. You can vote by simply clicking on the VOTE button. If you want more information about the photos or duellers, click on the VS button and you will be shown Duel Info button. If you click on this button you will go to a Voting Area. Members can also vote via Facebook and Instagram and they do not have to register. See the screenshot below. If you want to see the photos in all their magnificence, click on the icon in the top right corner of the photoduels to enter a fullscreen. Commenting is another great way to commend someone’s work. Share your thoughts with the community, feedback is always a good thing. 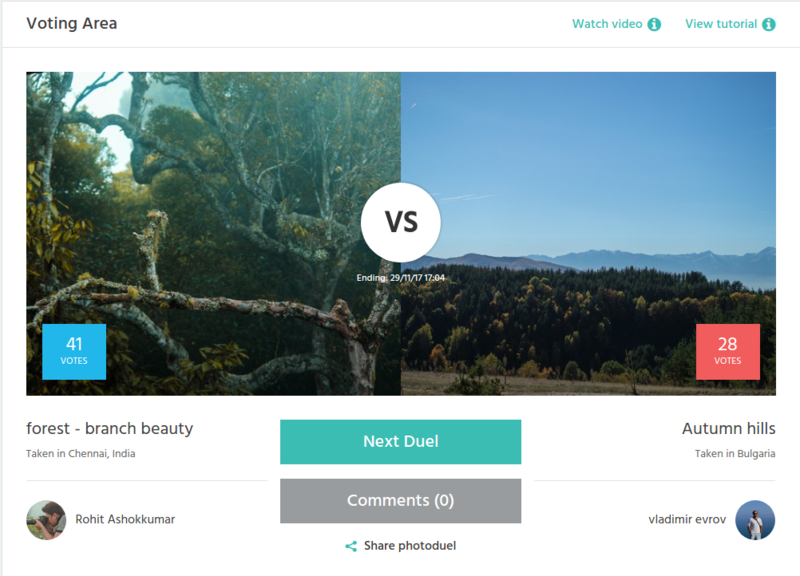 You can also download iOS or Android app and vote for your favourite photo in a duel. We made it sure you have the same interactive experience on mobile as on the desktop. Download your preferred app and enjoy while on the go. We guarantee you photoduels are as interesting on smaller screens as on the bigger screens. What is a Quick Duel? If you are in doubt which user is your best match for the duel, you can let the network choose for you. We have implemented a fast algorithm to enable the CoinaPhoto network to match the duellers. The platform picks one of your photographs and matches it with another user’s photo according to different criteria. Test the option, it’s fast, fun and surprising. The platform counts the number of wins and losses of each member and based on those numbers, users are being ranked accordingly in the section Top duellers. You can see the top-ranked duellers listed on the Photoduel Arena page. We have had a great opportunity to work with CoinaPhoto team for the past 3 years on developing new and interesting features. They first approached us to help them create a social network for passionate photographers. Together we have worked on bringing the new social experience to photographers and everyone in love with photography, and we will continue to create more interesting features. And register to test photoduels and tell us your experience.